NOW AVAILABLE at Berman INFINITI Merrillville, the all-new 2019 INFINITI QX50 for sale in Merrillville, IN brings tailored craftsmanship into the next era of advanced driving technology. Representing a strengthened connection between driver and vehicle, QX50 can help detect, guide and even intervene in a fraction of a second. Featuring both the world-exclusive VC-Turbo engine for efficient performance, and the new ProPILOT Assist system for peace-of-mind, the 2019 QX50 puts you at the center of every journey. Visit Berman INFINITI Merrillville today at 1794 W 81st Ave or contact us at (219) 964-4126 to learn more about the 2019 INFINITI QX50! 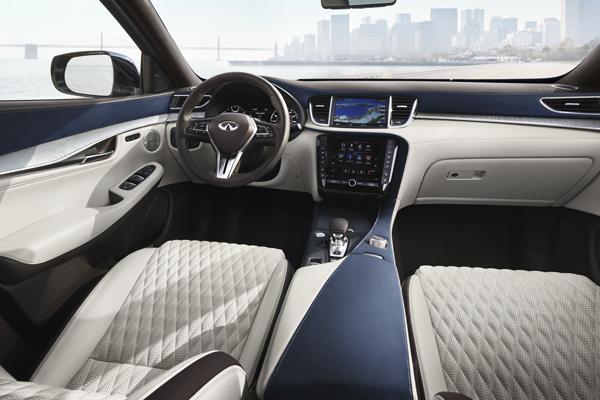 Tailored Finish – Open-pore wood accents and tailored leather stitching show the the human touch is alive in every aspect of the 2019 INFINITI QX50’s tasteful cabin design. Visit Berman INFINITI Merrillville to see it up close! Functional Comfort – QX50 offers an impressive 64 cubic feet of cargo space — enough for three full-size golf bags. Combined with its motion activated lift gate, QX50 lets you load and unload with ease. Tailored Finish – Open-pore wood accents and tailored leather stitching show the the human touch is alive in every aspect of the 2019 INFINITI QX50’s tasteful cabin design. Imagine having both sports car performance and eco-friendly efficiency on demand. The 2019 INFINITI QX50’s groundbreaking new VC-Turbo brings that vision into reality as the world’s first publicly available variable compression ratio engine. Designed without compromise, it powers the finest driving experience possible from the moment you press the ignition. Refined Performance – The historic compromise between power and efficiency ends with the 2019 QX50. More than just advanced engineering, it provides premium performance without limitation. Exclusive Innovation – Representing over 20 years of research and innovation, INFINITI’s new VC-Turbo is positioned to be one of the most advanced and responsive engine designs ever created. Revolutionary Design – Capable of physically transforming for any compression ratio from 8:1 (performance) to 14:1 (efficiency), the 268-hp 2.0-liter VC-Turbo engine seamlessly responds to unpredictable driving conditions on demand. Contact us today to be one of the first to test drive the 2019 INFINITI QX50 at Berman INFINITI Merrillville. Outer Strength – Muscular lines flow with profiled surfaces to create a body that is as strong as it is stylish. Offering a wider stance and cabin forward silhouette, the 2019 INFINITI QX50 features a purposeful exterior profile for strengthened visual character. 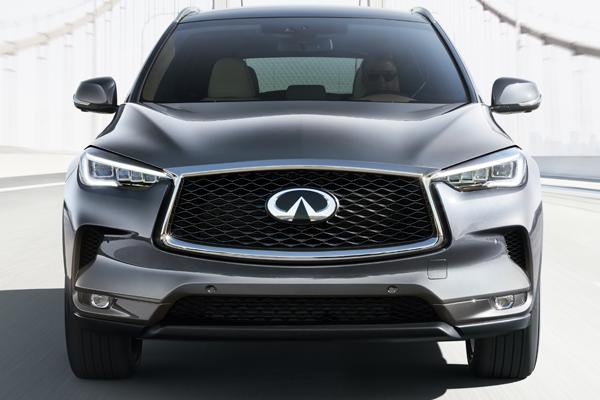 Fashion Forward – The INFINITI QX50’s signature double-arch grille has been expanded for 2019, with a deeper diamond mesh and a more aggressive feel. 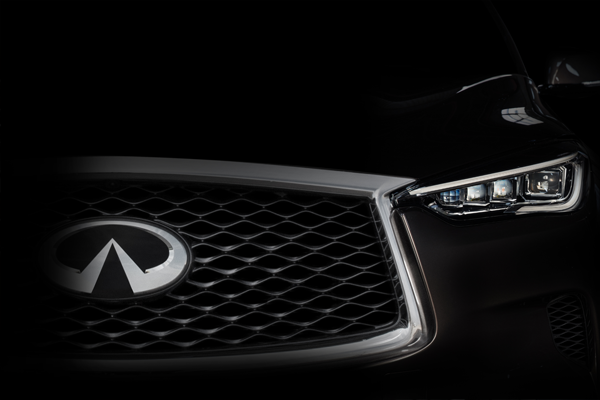 Illuminated Design – Signature LED headlamps in the 2019 QX50 blend technology with a sense of humanity. Day or night, their steady gaze is both functional and refined. Expansive Style – Contact us today to get your first look at the 2019 INFINITI QX50 complete redesign. INFINITI’s engineers moved the entire cabin forward — creating an extended body-length character line. The all-new 2019 INFINITI QX50’s driver assistance technologies combine to complement and enhance the driver’s natural abilities with features like Forward Emergency Braking, Steering Assist, Intelligent Cruise Control, Lane Departure Warning, Head-Up Display, and Driver-Control Assist. The Around View Monitor gives drivers Panoramic Awareness using four vehicle-mounted cameras to provide a full bird’s-eye view of the car ease parking and alert you of moving objects in front, behind, or beside your vehicle. Outer Strength – Muscular lines flow with profiled surfaces to create a body that is strong and stylish. Offering a wider stance & cabin forward silhouette, the 2019 QX50 features a purposeful exterior profile for strengthened visual character. 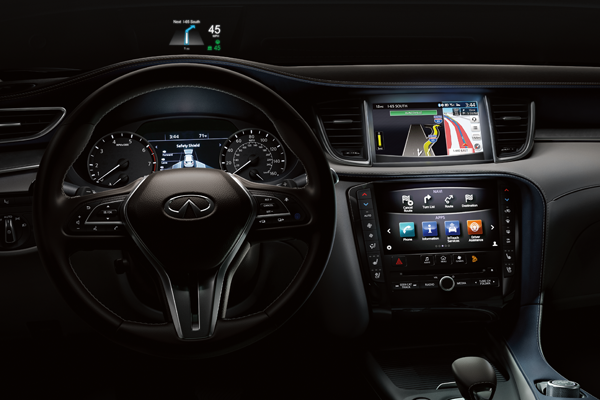 The all-new 2019 INFINITI QX50’s driver assistance technologies combine to complement and enhance the driver’s natural abilities with features like Forward Emergency Braking, Steering Assist, Intelligent Cruise Control, Lane Departure Warning, Head-Up Display, Around View Monitor, and Driver-Control Assist give drivers a bigger picture of the road. 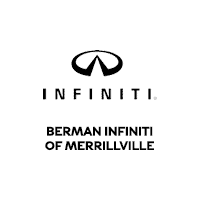 You can visit Berman INFINITI Merrillville at 1794 W 81st Ave in Merrillville, IN to see the 2019 INFINITI QX50. You can contact us to schedule an appointment, or get directions below!